US media last week mentioned Hurricane Harvey at least 100 times more than India. Outside the United States, media produced three times more about Texan flooding than Asia's in recent days. Monsoon floods on the other side of the world are worse than Harvey, but aid agencies say America's crisis is sucking up all the attention. Using open data, IRIN has quantified the relative online news coverage and found yawning gaps. It is important to note that headlines and news coverage are only part of the picture. Fundraisers know that some things will always resonate more with the public and studies show that donors are motivated by far more than just media. Academics differ on how much influence the "CNN effect" really has on international aid funding. However, based on previous experience, Harvey will generate a huge outpouring of public donations at home, while faraway crises have to fight harder for attention and money. Alison Carlman of GlobalGiving, an agency that fundraises for many often smaller non-profits and mostly in the United States, put it like this: "We're raising money for both floods. South Asian flood orgs have raised just over $12K. Our Harvey Fund is at $1.69M now. The Sierra Leone mudslides have raised $55K." This month, the South Asian floods have hit India, Bangladesh, and Nepal, which are facing exceptional weather and massive humanitarian impacts. Floods across the three countries have affected some 41 million people (That's about 10 times the total population of Metro Houston), according to the UN. In Asia, some 1,200 deaths are reported. In the United States, the death toll is slowly rising and currently stands at 38. GDELT, a huge database of online news from around the world, automatically tags articles with their topics and geographic focus. Of about 30 million stories it scanned, some 200,000 covered natural disasters so far this month. The GDELT data can help answer the question: How much attention have the Asian and American floods got at home and abroad? First we compared coverage of India, Bangladesh, and Nepal with coverage of the state of Texas. Not surprisingly, US media shows an explosion of coverage since Harvey emerged. The level of coverage of the Asian disasters is so much smaller it is almost insignificant by comparison. According to this data, at its peak, Texas coverage in the US is about 160 times that of the Asian flooding. Another database, MediaCloud, counts the number of words in articles produced by a range of US media. We searched the last week of news in US media for the word "flooding" and looked at the word counts. The graphic below represents how many times the top 500 words appear. The word "Houston" appears 100 times more than "India". Did the rest of the world's media do a little better at keeping an eye on Asia? 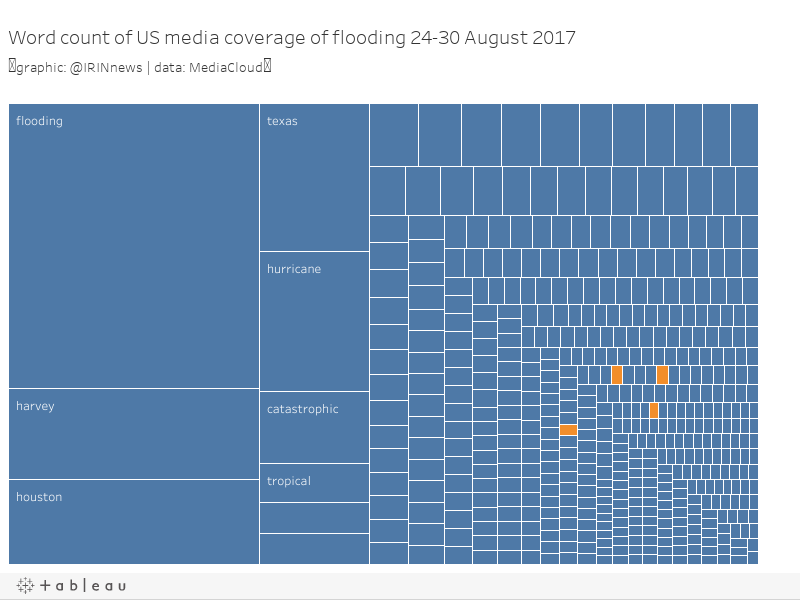 So far, the GDELT data suggests that non-American media have kept up some coverage of the Asian flooding, despite throwing resources at the Harvey story. The gap here is smaller – when Harvey was drenching Texas, it got three or four times as much coverage as the Asian disaster. There's no pretty way to say it: loss, pain, and drama make for compelling news. Especially when it's from home. Update: How did India's media cover Harvey? If the US media is not paying attention to floods in Asia, what about the other way around? How much coverage did Indian publications give to Harvey? The answer is: some, about a third, of the coverage of natural disasters at home.